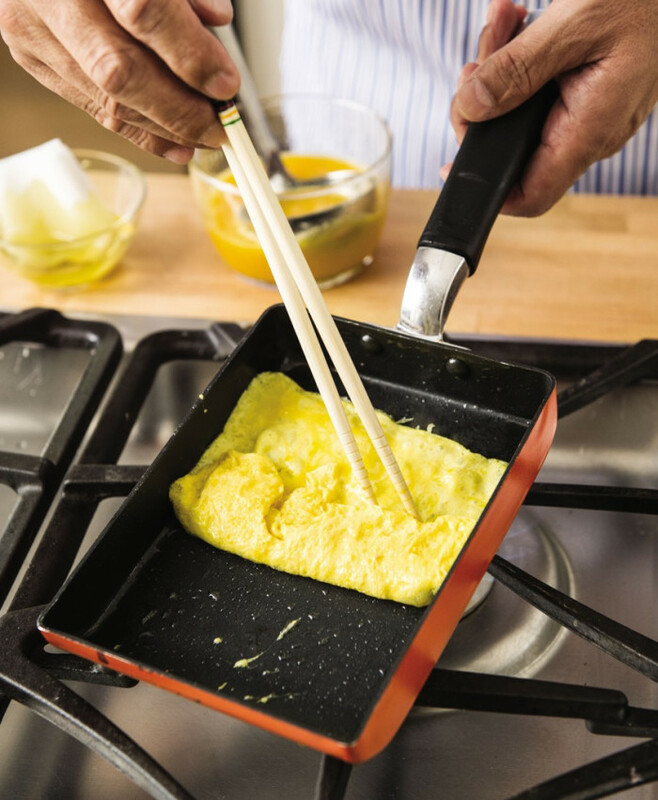 Learn how to make tamagoyaki like Iron Chef Masaharu Morimoto. Ready to learn how to make tamagoyaki like Masaharu Morimoto? This follow-up to his 2007 best-seller The New Art of Japanese Cooking is packed with essential wisdom on rice cookery, the science of furikake, the importance of bonito and the dexterity-heavy art of the sweet rolled omelet. If there’s a classic Japanese home-cooking technique you’ve been wanting to learn, whether it’s perfect tempura, flawlessly folded shumai or a simple bowl of noodles, this is the book to buy. Often called a Japanese omelet, this slightly sweet, custardy marvel might confuse anyone expecting the savory, ﬂuffy, herb-ﬂecked Western version. Yet one bite will turn you into a devotee. The magic is in the method, which creates many layers of eggy goodness. Most cooks use a kotobuki tamagoyaki, a special pan made for this dish, which you can have shipped to your door for just $20. Great warm for dinner or cold in a bento box the next day, tamagoyaki is one example of Japanese home cooking that takes a little time and practice to get right. But even your ﬁrst attempt will impress your friends, and you’ll get better and better each time you cook it. Combine the dashi, soy sauce, and sugar in a large bowl and stir until the sugar has dissolved. Add the eggs to the bowl and beat to combine well. Set a medium-mesh sieve over a measuring cup with a spout and pour in the egg mixture. Strain the mixture, stirring to get most of the liquid through, leaving just about a tablespoon of the thick whites in the sieve. 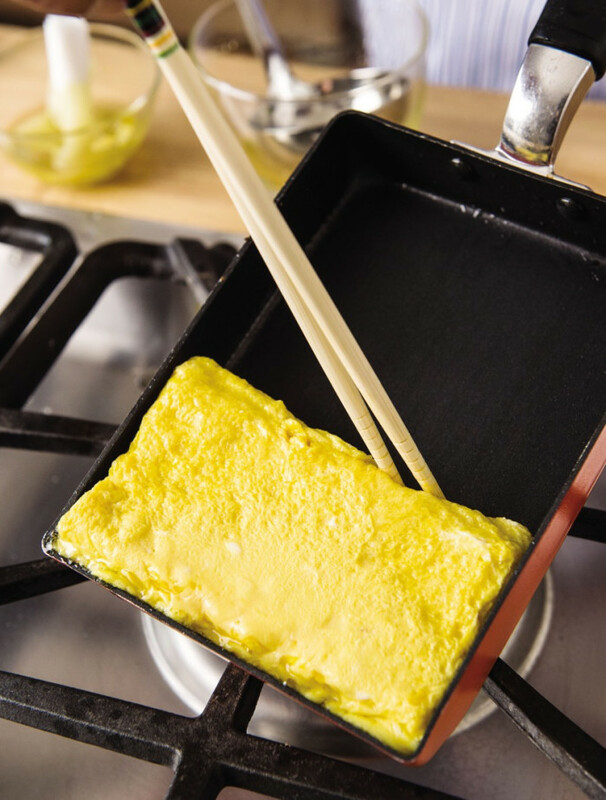 Set the tamagoyaki pan or an 8-inch nonstick skillet over medium heat. Let it get hot for a few minutes. Pour a tablespoon or two of the oil into a small bowl. Dip a folded paper towel into the oil and brieﬂy rub the surface and sides of the pan. Keep the paper towel nearby. Pour into the pan just enough of the egg mixture (about 3 tablespoons) to cover the surface and immediately swirl the egg mixture so it covers the bottom in a thin layer, pushing down any egg that sticks to the sides. Use chopsticks or the edge of a nonmetal spatula to pop any little bubbles that appear. Let the egg cook, without stirring, just until it sets, about 20 seconds. Take the pan off the heat, tilt the handle down, and use a nonmetal spatula to gently fold the egg forward in half onto itself. Set the pan back on the heat. Rub the empty space at the back of the pan with oil, then slide the cooked egg, using the spatula to help if need be, into the empty space. Rub the now-empty space in the front of the pan with oil. Pour about 3 tablespoons more of the egg mixture into the empty space, tilting the pan and slightly lifting the cooked egg so the liquidy egg runs underneath the cooked egg. Cook until the raw egg has just set, 30 to 45 seconds. 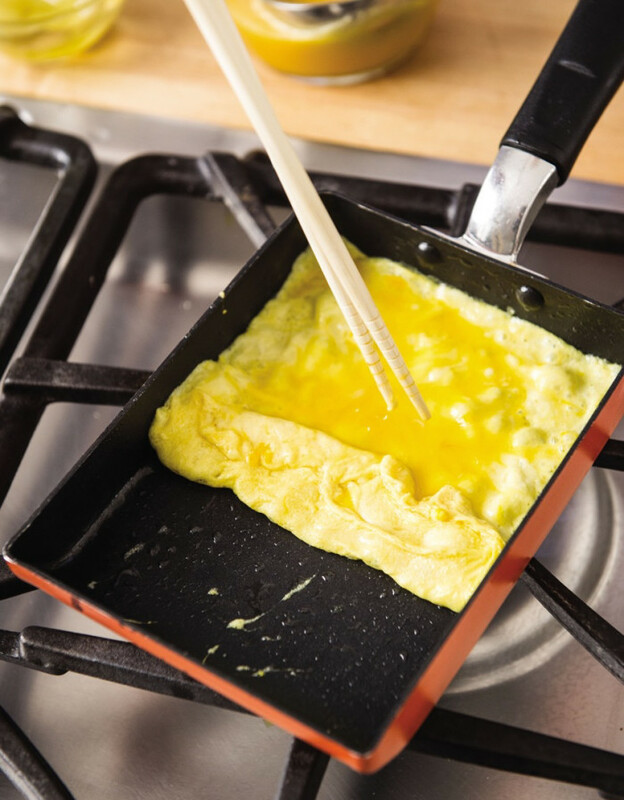 Take the pan off the heat, tilt the handle down, and use a spatula to gently fold the egg forward in half onto itself. Set the pan back on the heat again and repeat the process until you’ve used all of the egg mixture. If the omelet is not by this point golden brown in spots on both sides, cook over medium heat for a few minutes on each side. Transfer the omelet to a cutting board, let it cool slightly, and slice it crosswise into ¾-inch-thick slices. Serve warm. Wrapped in plastic wrap, the omelet keeps in the fridge for up to 2 days. 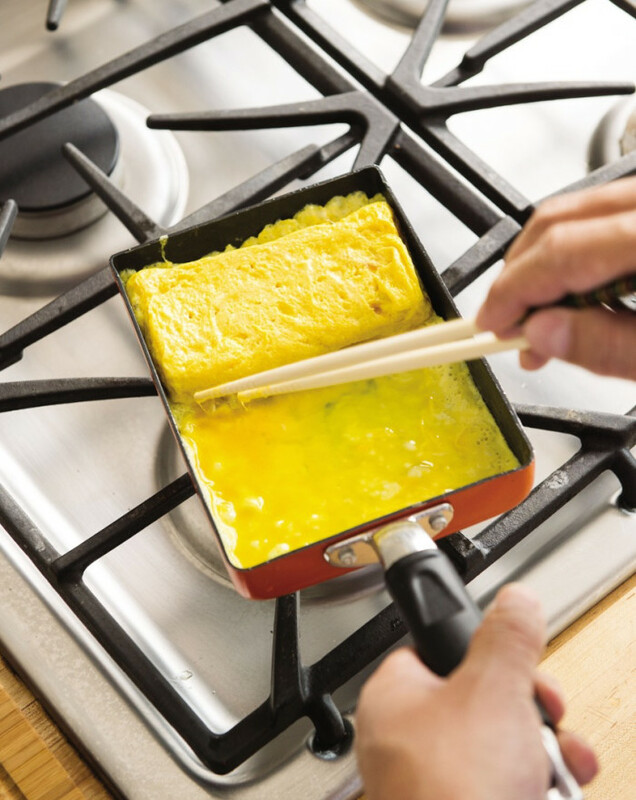 When you’re ready to serve, transfer the omelet to a cutting board and slice it crosswise into ¾-inch-thick slices.